When the victim entered the court, the APC members asked him to bring his mobile phone, and his refusal led to the attack on him. He ran inside the Judicial Service Commission’s office where he was attacked and computers in the office were destroyed by the mob. The officials of the court immediately vacated their office since they could not be helped by the mobile policemen around. The case of the suspects, who were arrested for allegedly setting up the legislator, was slated to come up before Magistrate Olusegun Ayilara. The Commissioner for Science and Innovation, Remi Omowaye, who apparently led the APC members from Ilesa, where the legislator represents, had challenged the prison officers for covering the faces of the suspects. He questioned why the prison officers prevented people from taking the picture and video of the accused persons. The six accused persons had been arraigned and remanded in prison while the case was adjourned for mention. The video tape of 2minutes 54 seconds of the legislator has gone viral on social media. 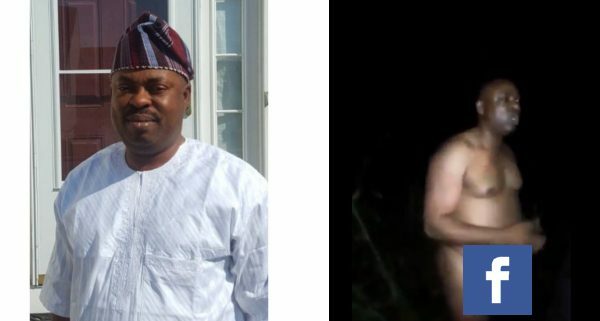 He was caught naked in the bush while allegedly trying to bath with blood. But the commissioner of police in the state, Fimihan Adeoye denied ritual cadr in the video saying it was a case of alleged financial scam.